I got a couple of request to start diabetic friendly lunch ideas. This is my first post on diabetic friendly lunch ideas which can be consumed by any normal person also. 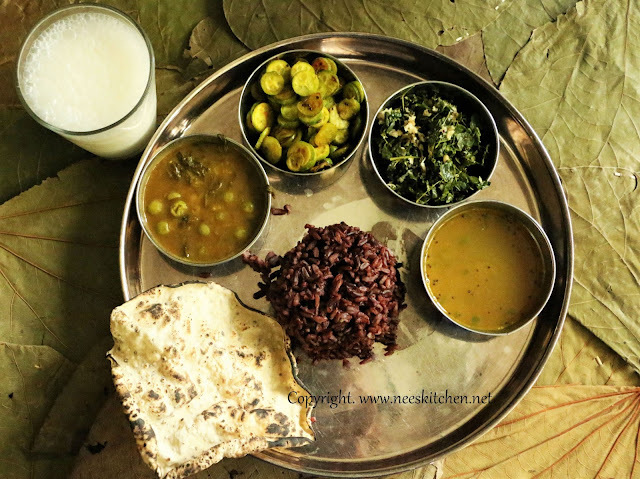 This lunch menu includes, plain cooked black rice, sundakkai(Turkey Berries) sambar, wheat grass rasam, tindora fry, murunga keerai (Moringa Leaves)poriyal, sutta appalam & banana stem buttermilk. You can find individual links inside. This is how I prepared this lunch menu. I have 3 burner stove hence can make in parallel. 1. Since I cooked black rice in rice cooker, the rice need not be soaked but it would take time to cook. First put the rice in the rice cooker. 2. Soak dhal for 1 hour (Sambar). Soak tamarind for sambar and rasam. Cut all the vegetables in parallel.